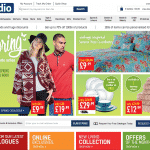 The Studio Mail Order Catalogue offers a range of goods from Homeware through to Gifts, Gadgets, Toys and the latest Tech. You can apply to spread the cost and pay monthly or choose buy now pay later. You will get an Instant decision and you can spend your Catalogue credit instantly if you are approved. The Studio Catalogue is packed with pretty much everything you need from a Mail order Catalogue. Pricing really stands out, compared to other high street mail order catalogues you can find a range of exclusive deals with gifts starting from under £10. You can spread the cost or order using a Credit or Debit card. The Studio Catalogue has been around for years, it started out as a business dedicated to Christmas cards and Personalised gifts, now you can still find great Christmas gifts and goods, they update their Christmas department all year round. Our Personal favourite is the Studio Christmas Section, Updated throughout the year. You can buy Christmas Cards, Christmas Trees and Christmas Decorations throughout the year, offering you the chance to plan Christmas long in advance. To improve your chances of being accepted for the Studio Catalogue please keep your first order below £200. You can apply for the Studio Catalogue online now and If your application is successful you can spend up to the Credit limit offered. The Studio Catalogue offers you the chance to pay monthly or spread the cost with buy now pay later. The Studio Catalogue is packed with a huge range of goods including Fashion, Home Accessories, Toys, Gifts, Furniture, Electrical Products, Gadgets and more. 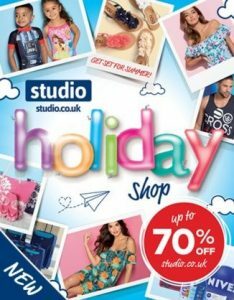 Studio offers a wonderful pay monthly catalogue packed with Gift ideas, fashion, homeware, appliances and electrical goods.